One of the great things about our country is found in the peaceful transfer of power resulting from a free election. One of the worst things about our country is seen in the political advertising that takes place leading up to the said election. Case and point, today’s Albuquerque Journal featured a new front page “sticky” asking voters to elect the sitting Sheriff for another term. 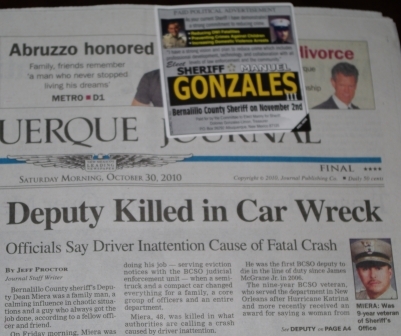 It was placed right next to the lead headline, a story about one of his Deputies who was killed yesterday. It is possible that the Sheriff’s campaign was given the option to pull his sticker. If that is the case then his campaign deserves what it gets. The lines between news and advertising are already blurred in some unfortunate ways, would it have been too much to pull the sticky ads for a day? What responsibility, if any, does the newspaper have in showing some simple sensitivity when a public servant is killed in the line of duty by making an decision to pull a 25 cent political sticker from its front page? 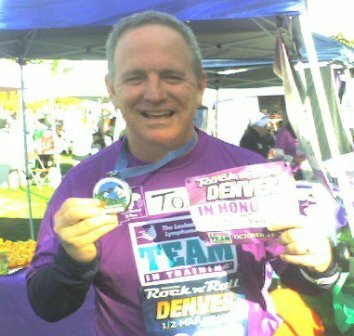 Since January of this year (2010), I’ve been participating in the Team in Training program offered by the Leukemia & Lymphoma Society. As a result of their program, I’ve had a chance to raise awareness about blood cancers, generate some additional funds for medical research and complete a few memorable athletic milestones. I’ve had the opportunity to train with a lot of quality people. Everyone is pacing around the asphalt jungle for their own reasons. Watching, and running alongside the people I consider to be elite runners is really quite an experience. By running vicariously through Jaynee, Chris and Javier I’ve run sub-4 hour marathons! The coaches are some of the best; Jeff, Michelle and Bryan. They provide motivation, insight and encouragement. There are a number of coaches whom I’ve only met on the race course, they provided a calming guidance that helped me to run my own race. Even before this year’s training, the quote “Run in such a way that you may win,” connected with me. Most of the people I train with finish their respective races. Surprisingly, despite the training, some runners do not cross the finish line. These are some of the great things about our team. They set their own goals, their own pace. They weren’t swayed by the elite runners or slowed by those of us on the scenic route. They are comfortable in their own skin, know their abilities and limits (most of the time). They feel compassion as they see runners bonk and are reminded that it could be them. They push to do better next time. While they are encouraged by the crowd, they aren’t guided by the drama of it all. They run for their own reasons, their own plan, their own goals. They run their own race. Whenever the weather would turn stormy the skies above my childhood house got noisy with low flying aircraft. We couldn’t do anything about it, the house was under an alternate flight path for Houston Intercontinental Airport. While those plane engines all but drowned out the noise of our dog’s breathing, the sounds couldn’t hold a candle to the noise made when opening a bag of Sun Chips. Much to the dismay of 5 year old boys, Frito Lay announced it would be discontinuing the 100% compostable bags. Think of biodegradable bags like the Tablet PCs released several years ago. They didn’t catch on. Fast forward, make some tweaks, find the right target audience and you have key ingredients for an iPad success. Where did Frito Lay’s process fail that it allowed the Sun Chips packaging to become so loud and obtrusive that it dwarfed the sound of its product? While that question will be the focus of business school case studies, here is my perspective. In the rush to be “green” and friendly to moms who make the buying decisions in families, Frito Lay might have rushed its own internal processes to be first to market. The first to market doesn’t always win, unless it is supported by sound research.